Victims of a crime will look for a Police Officer for protection or justice. They can pick them out of a crowd just by seeing their uniform. An injured person will look for a person with medical expertise to help them. They can pick them out of a crowd just by seeing their uniform. If a person is seeking God in the flesh, well they wont find Him at all. This is not a problem because He called and ordained many representatives (ministers) who can guide others to Jesus. Jesus in turn, will take them to Him. Let the public know you are one of His representative by your uniform. No, the Bible never specifies anywhere that ministers must wear a uniform however, we know from Exodus 39:1 that Clergy attire was accepted of God and still remains a traditional uniform. Clergy, although you are equal to all others in God’s eyes, you have been called, ordained and set apart by God to lead, to preach, teach and baptize! A great responsibility. 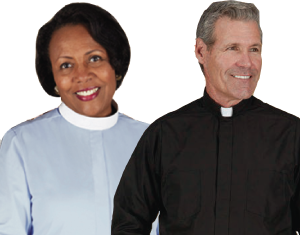 Clergy attire simply serves to help others identify you as God’s representative, a Christian leader. Don’t believe us? Just sit in a coffee shop in your Clergy shirt and see how many will approach you for answers or prayer (btw.. a neat way to witness for Christ). WARNING Clergy attire is not ‘Power Dressing’ by any means and does not allow for arrogance, respect or authority in any way. It should be simple so as not to draw more attention than the message and the wearer humble. In fact, Matthew 23 warns of hypocrisy involving Clerical garments. Clergy attire on its own does not cause anyone to ‘power trip’. It is the desire of the individual that seeks power, acceptance, status, respect and authority. A dangerous mix and a dangerous spirit to possess. Clergy with those motives will have to deal with the Almighty on that one.